Race Mario and friends around an all-new series of circuits set in the Mushroom Kingdom. There are 12 characters and 36 vehicles to choose from at the start, including the all-new bikes, each with their own characteristics for speed, weight, acceleration, handling, drift, off-road and mini-turbo. 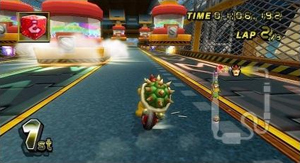 Mario Kart Wii is compatible with the Nintendo Wi-Fi Connection, allowing up to 12 players to race and battle online. Worldwide and regional players are ranked based on their performance and are matched against players of a similar rank. The design and name of the medium weight Mach Bike suggest that it was modelled after the protagonist's bike in Mach Rider (NES 1985). 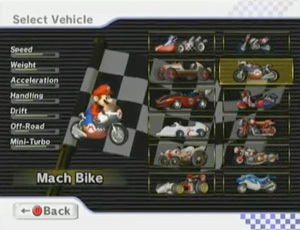 The Wario Bike is based on Wario's motorbike from WarioWare, Inc.: Mega Microgames and its sequels. 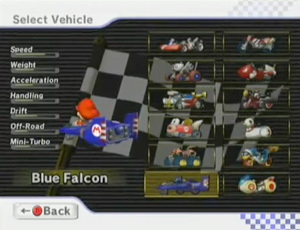 One of the unlockable small karts is named Blue Falcon, and modelled after Captain Falcon's F-Zero racing machine from the F-Zero series. One of the unlockable small karts is named Tiny Titan and is modelled after the Monster car from Famicom Grand Prix II: 3D Hot Rally (NES 1988). 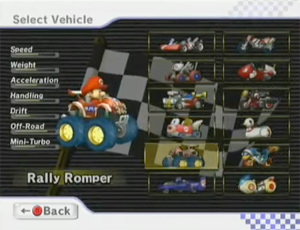 The original Japanese name for the kart is Hot Rally, and the PAL name is Rally Romper.